Crest: Tree Stump - a symbol of worship and rebirth. I have a Cypress tree (death and eternal life) and a Palm tree (righteousness and resurrection) growing out of my tree stump to signify regrowth. Torse: Azure in color to represent steadfastness, strength and truth. It is securing the Bible in place. Helm: The Word of God, secured with the Torse. An open book like mine signifies manifestation and learning. The Bare Arm represents an industrious person, someone who believes in hard work. The Broken Lance is a symbol of peace. The Sword in the Heart signifies the power and freedom generated from a broken heart. The heart is a symbol of goodness and charity, I thought it appropriate that mine is currently unable to work properly. Supporters: I have a Boar and a Swan supporting my coat of armor. The Boar is a symbol of courage and is a fierce fighter. The Swan represents the arts - poets and musicians. It symbolizes beauty, grace, love, and sincerity. I put some Antlers under my coat of arms to signify strength and fortitude. Mantling: My mantling contains some thistle which represents pain and suffering and I stuck a nail on each side to represent passion and to signify remembrance and sorrow. Name: I have a maiden name and a married name, but I chose to use my first name. This is the year my husband and I split up after 30 years of marriage, so my married name no longer applies in my mind. Neither does my maiden name since my father gave me away to my husband who has now given me back -- like a borrowed pair of rain boots or something. Amid all this giving back and forth of myself, I decided to "take" myself and I'm going with my first name. Now it's your turn! 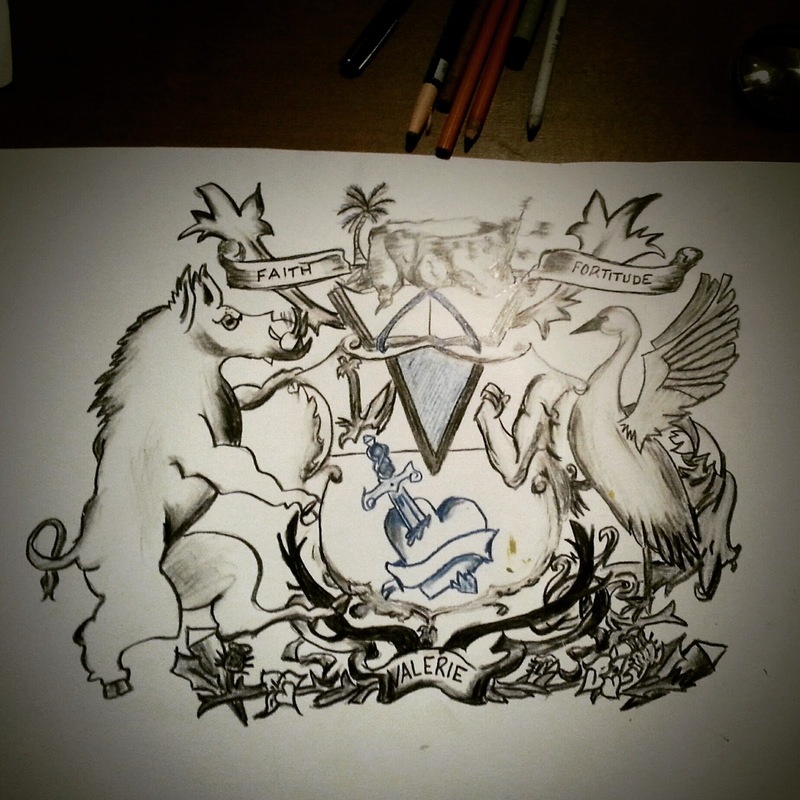 What would your coat of arms contain? A lot of work and tears went into this and a with a lot of tears I am reading it. You are a strong woman with great potential and as Dr. Hudson used to say "keep on keeping on", and with God and your life will be full again. 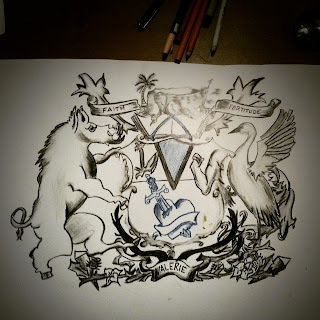 A very good description of your coat of arms! Very complete and the only question I have is , what is a Torse? Lois, the torse is wreath, ivy, ribbon -- something to wind around the top and connect things. I just had mine wind down the Bible and I didn't do any type of wreath at the top. Making decisions without 'having' to consult or consider another or a group of 'anothers' is huge undertaking. As a nurturer of others, it is so hard sometimes to nuture ourselves.